This month, Scivera toxicologist Colleen McLoughlin, Ph.D. DABT, E.R.T. presented at the Society of Toxicology Annual Meeting in San Antonio Texas. Dr. McLoughlin presented a poster entitled “Authoritative Listings of Carcinogenic Compounds: Identification and Comparison to QSAR Modeling Tools’ Results” which was co-authored by Joe Rinkevich (Scivera President), Dr. Pat Beattie (Scivera Vice President Scientific Development) and Mary Ruhter (Scivera Toxicologist). This poster summarized a broad area of work Scivera’s team of toxicologists and chemicals management experts is leading to support global brands and their suppliers in reliable and cost-effective chemicals assessment and selection. Scivera embarked on this project to further explore the correlation between chemicals used in commerce, chemicals listed by authorities for known characteristics, and available approaches to sufficiently understand the health and safety of chemicals used in commerce and currently not listed by authorities. While lists can be a useful indicator of one or more characteristics for chemicals, in our work we have found that lists are not all-inclusive and do not provide sufficient insight for brands to fully manage chemical risks. And perhaps even more importantly, our toxicology work proves how screening chemicals against restricted substance lists (“RSLs”) are not sufficient guidance for managing chemicals of concern. Software and services that offer list screening can be a useful first step, but list screening is not a hazard assessment and should not be considered as such. As part of Scivera’s chemicals screening and assessment processes, the team manages a variety of chemical lists (e.g., RSLs, preferred chemical lists, inventories, and organization-specific lists) for subscribers of our web-based chemicals management application, SciveraLENS®. Many authorities publish lists of chemicals based on specific characteristics to provide guidance to industries, organizations, and the general public. For example, the World Health Organization, International Agency for Research on Cancer (IARC) publishes a list of chemicals with potential carcinogenic risk to humans. This type of information can be very useful for decision-makers working to avoid, restrict, or even ban the most harmful chemicals. It can also create challenges for teams in companies doing chemicals management work. Chemicals used in products and processes often are not listed by authorities as harmful or safe, and often lack experimental data to indicate safety characteristics. These chemicals require other methods to predict human and environmental health. Toxicologists use a “read-across” process to find chemicals of similar molecular structure and physical properties to draw connections and predict safety of chemicals lacking data. Toxicologist also use computer modeling to predict characteristics of chemicals in the absence of data. 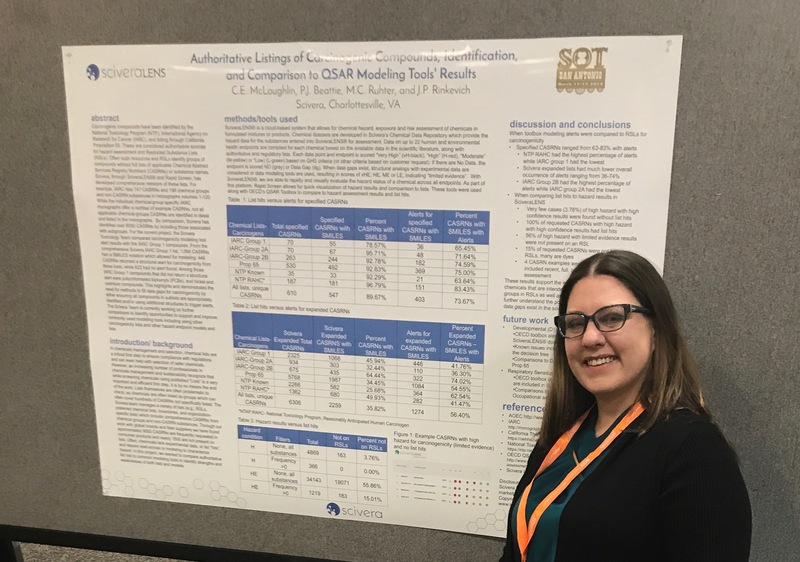 In this project, Scivera’s toxicologists wanted to compare authoritative list hits to common modeling tools to identify strengths and weaknesses of each approach. The team compared carcinogenic compounds identified by the National Toxicology Program (NTP), International Agency on Research for Cancer (IARC), and listing through California Proposition 65 to modeling results for carcinogenicity (i.e., potential to cause cancer), one of 22 areas of investigation, or “endpoints”, toxicologists examine to assess chemicals for human and environmental health. In addition to the results for listed chemicals, our research included what we call Expanded Lists. Scivera Expanded Lists include specific chemicals that fit into general chemical groups indicated in a published list. For example, Washington State Chemicals of High Concern to Children includes approximately 70 specific chemicals and 7 chemical groups (e.g., mercury and its compounds). When expanded to all chemicals that fit the groups, the Washington list grows to almost 4,000 chemicals to track. This additional layer of complexity in screening products against lists adds to the challenge companies face in managing chemicals. In our research, we found that although there was high correlation between alerts generated by models and list hits, this decreased when chemical groups were fully expanded and included. Most chemicals with experimental evidence of carcinogenicity appear on applicable lists. However, over half of the chemicals in this study showing modeled or analogous evidence of carcinogenicity are not yet on applicable lists. These results support the critical importance of understanding chemicals beyond the presence, or absence, on a list. To implement effective chemicals management and alternatives assessment, decision-makers must understand chemicals for their human and environmental characteristics via specific hazard assessment processes. True hazard assessment based on experimental data is essential for informed selection of chemicals in products and processes. When inevitable data gaps exist for chemicals, read-across and modeling strategies by trained professionals can support understanding potential hazards. This work also underscores the critical importance of identifying the specific chemicals that are intended to be covered by chemical groups in lists. Contact Scivera today if you would like a copy of the poster! The New California Proposition 65 Rules Are Here. Are You Ready? Login in to SciveraLENS Enterprise using your custom subdomain, i.e. yoursite.scivera.com. Login in to SciveraLENS GoodBOS using your custom subdomain, i.e. yoursite.scivera.com.